Sitting on my bookshelf I have a book called Fat, which is mostly cookbook with all sorts of interesting information about different types of fat. If that seems like a narrow focus on an ingredient, then Milk, by Anne Mendelson, would seem impossibly narrow. Definitely not the book for someone who is lactose intolerant. Or maybe it is, if that someone is only mildly lactose intolerant, because the book talks about which milks and which processes make the milk more tolerable. 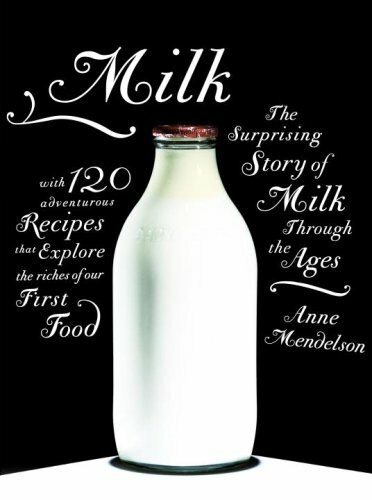 The book starts out with the history of the use of milk-producing animals and the types of products that were consumed. What's interesting is that until recently, fresh milk was a pretty rare product because unless you had a cow (or other milk-producing animal) and unless you used the product almost immediately, the milk didn't stay fresh for very long. The warm, fresh milk would start its inevitable process toward fermentation very quickly unless there was some way to chill it. So, before refrigeration, the goal was to find a way to control the fermentation so the milk went bad in a good way. Yogurt, for example. Now, yogurt seems complicated and mysterious, but before refrigeration it was almost a natural occurrence, and more commonly consumed than fresh milk. After the section on milk itself (followed by recipes that use milk and cream) the book continues with sections on yogurt, cultured milk and cream, butter and true buttermilk, and fresh cheeses. And each section has instructions on how to make the product, followed by instructions on how to use the product you've made. Or, if making it was a one-time project, how to use the commercial versions. One of the more interesting things (and possibly most controversial thing) in this book is the author's stance on organic milk. You'd think that organic would be the hands-down favorite because it's the cleaner, gentler, kinder and more natural form of milk. But, no. The author suggests that in terms of the treatment of the cows, there's not much difference between the milk from regular dairies and the milk from large organic dairies. The labels that claim that the organic milk is antibiotic-free is a bit misleading, since all milk has to be antibiotic-free, according to regulations. So there's no difference between organic and non with that regard. On the downside, much of the organic milk on the market has been ultra-pasteurized, while conventional milk had simply been pasteurized. Ultra-pasteurizing doesn't make the milk safer or better, it's simply a different method. Regular pasteurizing heats the milk for a longer time to a lower temperature. Ultra-pasteurizing uses a much higher heat for a shorter period of time, and the author's contention is that the higher heat destroys some imporant characterists in the milk. If you're going to boil the heck out of it anyway, then it's not going to matter. But if you're trying to make ice cream or cheese, or if you care about the subtlties of the flavor, the ultra-pasteurized is not what you want. Instead of choosing organic milk, the author suggests trying to find milk from a small local dairy, looking for unhomogenized milk if possible, and avoiding any milk that is ultra-pasteurized. It's possible that your small local dairy might also be an organic dairy, but the important factor, according to the author, is how the milk was pasteurized. While some people might not think that a milk choice could be controversial, I know a lot of people who prefer organic over anything else and who, if they have to make hard choices about what organic products they choose, make milk a priority purchase. I'm not making any personal recommendations here, but after reading the book, what she says does make a lot of sense: if large organic dairies are producing the same quality product as large conventional dairies, then the difference between the two occurs after the milk has left the cow. Because organic milk is a smaller market and may be shipped longer distances to retail locations, those dairies want their milk to have a longer shelf life. Thus, they ultra-pasteurize. This is also why regular pasteurized cream is so hard to find. It's a narrow market and the sellers want it to stay on the shelf as long as possible, so most of it is ultra-pasteurized. And much of it includes extra ingredients, like gums and thickeners. As far as milk purchases, a local dairy with a small herd will probably be producing a better quality milk than a large commercial operation. (There are a lot of details in the book as to why this is the case. Suffice it to say that I'm convinced.) If that milk is shipped and sold locally, it doesn't need to be ultra-pasteurized, so it's a better choice for the quality of the original milk and for the handling afterward. The author also recommends buying non-homogenized milk, if possible. Now, that's interesting. I don't think I've ever seen any milk in a store that hasn't been both homogenized and pasteurized. But now that she's mentioned it, I'll be looking to see if such a thing exists in my area. Another little controversy that the author stirs up revolves around the "fact" that growing children need to drink a lot of fresh milk. Given that fresh milk is a relatively new product, it begs the question of how humanity survived for so long without any fresh milk at all. The answer has a lot to do with marketing. What I really appreciate about this book is that the author is very clear when she's stating a researched fact and when she's offering her opinion. And when the facts aren't clear, she admits it. In the section about milk fat properties, she notes that scientists haven't yet untangled all the intracasies, but she offers the basics that a reader might care about. When it comes to names of cheeses, she makes it clear that there are few cheeses where names are regulated, but for the rest of them, there is a lot of confusion. The names of cheeses across borders can mean completely different things. Again, she offers basic descriptions, while admitting that the lines are quite blurry and there is no one correct definition for many cheeses. Since she's upfront about the fuzzy facts, I'm more ameniable to accepting that what she has researched is likely to be true, or at least as true as I need it to be when I'm adding milk to my morning coffee. While my original interest in this book was the recipes, the rest of the book has been quite enlightening. And entertaining. I don't think I'll look at milk the same way again. his about organic vs commercial is true, but the best tasting is right out of the bulk tank. Not cooked, pasturized or homogenized. Just real, honest to goodness milk the way nature intended it, and icy cold. If the farm ships its milk commercially, there should be no worry about pathogens or diseases as the cows and milk are tested frequently for all known problems.